A classic Flight Simulation from the 1980's. Developer - by Geoff Crammond, , creator of the 'Grand Prix' games, Stunt Car Racer, and Sentinel. Comments - Written for the BBC MicroComputer. More info at www.beebgames.com.
" Hey.. who needs texture mapping? Who needs colour come to that... Aviator allowed you to pilot your Spitfire under bridges and fly upside-down - even to shoot some invading aliens. " Image and text Source - http://arrgh.rubberfeet.org/hardware/bbcmicro/. Used by permission of Mat Simpson.
" 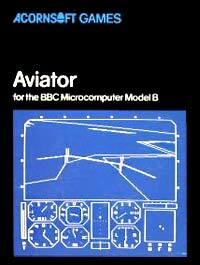 One of his (Geoff Crammond's) early releases was Aviator, a Spitfire simulator marketed for the BBC Micro by Acornsoft. Although it had monochrome Mode 5 graphics and few of the ameneties of modern simulators for more powerful computers, Aviator was of unparalleled quality at the time of its release (c. 1983), with a realistic flight model that included g-forces that could tear the wings off in a dive. Applying forward pressure on the analog stick restored the wings, however! Bonus points could be earned for flying among city blocks or under bridges, particularly upside down."